London South Bank University (LSBU) students are this week exhibiting a range of photobooks, inspired by the works on display in Borough Road Gallery's current exhibition 'David Bomberg: Objects of Collection'. On display in the Digital Gallery, adjacent to Borough Road Gallery in Borough Road, the students were commissioned by the Gallery to create the photobooks in response to the current exhibition, which focuses on the work of renowned painter David Bomberg. Students were invited to develop a poetic, personal and intimate perspective of the collection, calling into question how the collection and archive represent the artwork, and how the public consumes the representation of the artists' works and lives. When compared to an exhibition, the photobook offers an alternative space - it is a portable object, that can be easily reproduced and circulate, reaching a far wider audience. Crucially, photography's relationship to time and space can be explored in the photobook to probe the relationship between photography, the archives and the everyday - placing the subject of the exhibition in unforeseen contexts where new associations can be explored and imagined. The second-year Digital Photography students were commissioned by Borough Road Gallery to create new photobooks in response to the current exhibition 'David Bomberg: Objects of Collection'. The resulting photobooks are exhibited in parallel to the exhibition in the Digital Gallery Tuesday 10th -Thursday 12th December 2013. Borough Road Gallery opened with its first exhibition in June 2012, following which students were commissioned to develop new work in response to the exhibition London's Post War Art Scene: David Bomberg & The Borough Group. The resulting photobooks were shown in the exhibition Borough – photobook: print brush stroke page flow in the Digital Gallery in November 2012. 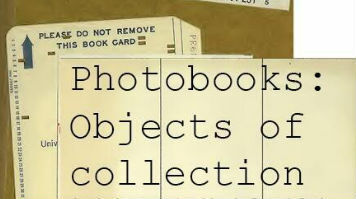 The student exhibition, Photobooks: Objects of Collection, will be on display in the Digital Gallery Wednesday 11 and Thursday 12 December 2017, from 1 – 5pm.